Confession moment: I would love to have a house as cool as the "tower" in the movie and ride on that bad flying baby! Heck, I wouldn't even mind the bike...although I have a fear for bikes. So a while back, Nuffnang had the premiere screening for the movie Oblivion in which I didn't go for because Kin and I were hitting on some rough patches and I just didn't have the mood for anything but to mope around and do stuff that didn't remind me of him. Then again we've figured things out and we're giving each other another go so he thought it would be good to do some couple-ish things and get the feel all over again and yesterday when he sent me to fix my Samsung Galaxy S3, he mentioned that we should watch Oblivion today. Off we went to get our tickets from GSC in 1U which shockingly donned a pretty empty hall when we bought it (Friday and the seats are not snapped up? Odd isn't it?) but it was fine since we could pick out one of the best seats around the hall. I guess that's where my RM 13 gets worthy. I got to pick my seats but otherwise the movie was a let down all together. The movie gets set in the year 2077, a world where Earth is just a dead place, where humans no longer live in this radiation filled land and a couple is seen to hold what promises them of a better life than what they have lived. 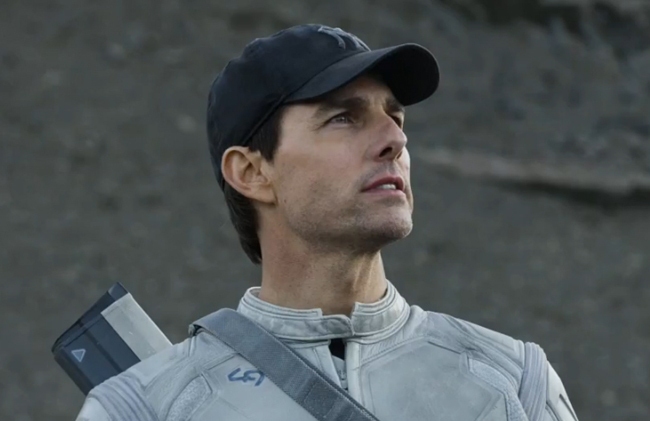 Jack Harper a.k.a Tom Cruise however seems to be much more interested in whatever is left of his memories since the mandatory wipe out (much like a computer getting formatted or something like that) and somehow succumbs to whatever he could recall and saves what appears to be a survivor from the war between the "scavengers" and mankind. He later on gets caught by the "scavengers" and finds that what he has been promised has been a lie all together and fights back only to find that he's nothing but a clone. Have I lost you yet? I'm sure I lost myself anyway because that's how bad the movie was. 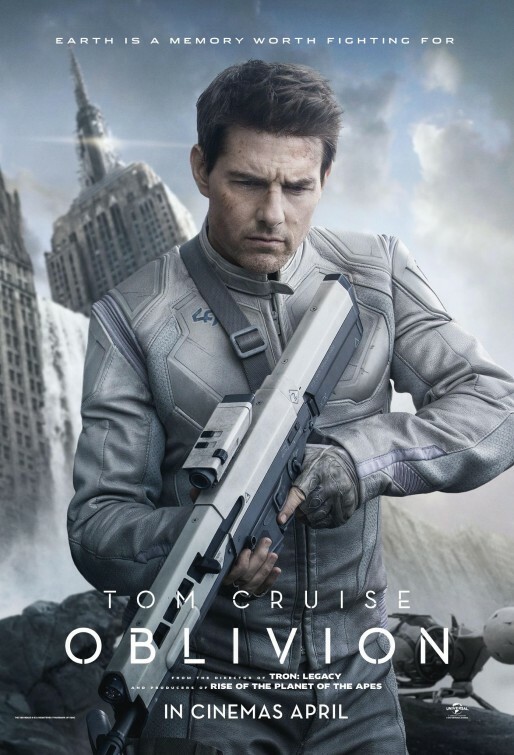 I couldn't even get a quarter of whatever Oblivion was about much less find it an interesting movie. Sure, the graphics of the drones and whatever appears to be a possibility of a broken future in mankind were very impressive and even the high tech computers and technologies made for a very interesting watch but that's just about whatever attracts me. I could have sworn by one hour in I was very much prepared to snuggle into my jacket and just sleep off the rest of the movie anyway but being the extreme Chinese in me, I couldn't just let the movie ticket go to waste! I paid for it! But really, it was terrible. It probably holds the third place of the worst movies I've watched recently with the first being Dead Man Down followed by The Host. And then he's human. Or something like that. 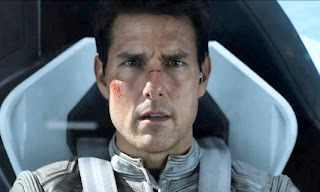 Yes, I hardly post up double pictures of a single character but I think Tom Cruise does deserve some of that. He's actually quite handsome when you look at him long enough to ignore the fact that he's a shorty. However that's as far as his talents runs. Granted he may have been in his "I no longer remember how to be human because all my memories has been wiped off" show but I wish he could have been a little more...natural at it. Here we see Cruise attempting to be robotic, to be heartless and possesses no means compassion because it's how he is *supposed* to be, yet at the same time being human and having to live with a memory within himself that he doesn't remember about. That doesn't even make sense to me anymore. Phew. I'm just there to talk to you while you're out risking your life. Andrea Riseborough plays Victoria; the supposed other half and the extremely effective partner to Jack Harper in this movie. Her face reminds me just that little bit of Gillian Anderson (Best known as Dana Scully of The X-Files) for some reason really. As I've mentioned, she is supposedly the "effective" partner (I will explain why later I'm stressing out on this matter) to Jack Harper but all she really does is put on an ear piece and tell Jack where to go in his little bubble of a flying machine. Acting wise; perhaps like Cruise, she has to remain composed and incomplete of a human but she has knocked it off well. Shrugging off with a cool and calm demeanor, Riseborough does get through to your head at times. A well executed scene however must have been her crying scene whereby we see her real tears just rolling down her face without much force when she notices that Jack was away with Julia. Classy. Now as for why I'm repetitively noting that she's an "effective" partner, it's really because the lady over at the command center called Sally (Acted by Melissa Leo) just keeps asking Victoria every single day if she and Jack are an effective team in their mission. I mean, hello you've asked yesterday? What difference could it make in a day where there is no one else, no plants and no pets to be around with? Heck yes they are an effective team...until Jack grew some brains and decided to stop being effective. Happy yet, Sally? Just stop asking already! I'm that pretty girl in your memory and the one you'll never forget. Olga Kurylenko plays Julia Harper; the supposed wife to Jack Harper whom has been in a sleeping pod for as long as anyone could assume and takes on the role of a flight assistant during a mission by NASA to check out on the "new Earth" that mankind could take on. Beautiful and strikes off a lean sized body, Kurylenko is definitely someone to watch not because of her acting but simply because of her looks. Her acting seriously needs work though; with her laughs being terribly forced, tears being absolutely nothing but crocodile tears and her lines being thrown out just because she has to. Like I said, watch her just because she's...watchable not because she's good alright? Just as an overall, Oblivion hits up on a 3/10 on my personal scale with points probably headed on for the cute looks of Tom Cruise, the graphics and the amazing imagination of a dead mankind. It's not exactly the kind of show you'd take a girl for a first date and neither should it actually be the kind of movie to watch if you're looking out for some hot action with sizzling scenes that takes you on an adventure. Just...no. Should have bought two pieces of cone pizza with my RM 13. Damnit. i was mindfucked during the movie. I was just lost throughout.